Mehr Demokratie is the driving force for referenda, a better electoral law and more transparency. Every vote counts equally and everybody has the right to participate. Citizens, committed to change, founded Mehr Demokratie in 1988. 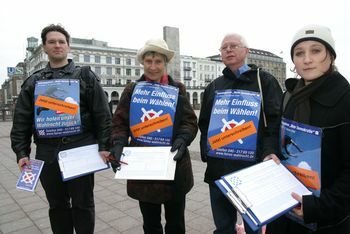 Through different initiatives and activities, we promote direct democracy in Germany and Europe. We perform lobbying on federal and state level and inform the media on matters relating to democracy. Further, we advise citizens' initiatives and consult administrations and policy-makers. In addition, we conduct research concerning the practical implications of referenda, electoral law and transparency. Mehr Demokratie is a nonprofit organization, working above political party lines. Referenda, electoral law and transparency have no political affiliation; instead democracy affects everyone. Democracy can never arrive at its final stage. Rather, the system develops in line with the surrounding society, evolving from time to time. New challenges demand new democratic responses. In order to cope with those challenges, Mehr Demokratie advocates referenda, fair elections and more transparency. We plead for the implementation of refernda at federal level. Referenda are already used on state as well as on communal level, but this democratic tool has not been adopted on federal level. Yet, citizens endorse the implementation more and more. In the federal states, we aim for citizen-friendly rules allowing for a direct democracy. The right to hold referenda is ineffectual, if obstacles hinder the initiation of a referendum. A poorly-designed process delivers unsatisfying results, damaging democracy. Referenda are no ends in themselves. This tool has many positive effects on society and the democratic system. Referenda allow for wide-ranging public discussions, educating citizens. If citizens can co-decide, financial resources are used more wisely. Furthermore, organizing a petition engages numbers of people; many are likely to further participate in the political arena. An increased political participation creates more diversity. In the end, political decisions are more widely accepted as the people collectively decide. In order for elections to mirror the voters' intent, the voting procedure has to be sound. It is not sufficient, if a voter consents to a party's agenda, but does not agree with the politician, who has yet to implement the agenda. Thus, we want the citizens to have greater influence on the personal setup of parliaments and councils. Furthermore, foreigners should as well enjoy the right to vote. Political power can be exerted with much more than elections and referenda. Also, knowledge is power. Without access to all relevant information of public administrations voters and politicians are not able to make informed decisions. Access to such information will strengthen the public scrutiny of what authorities are doing. We therefore demand more transparency in politics and administration. Our goals: to strengthen direct democracy, democratize elections, create more transparency!